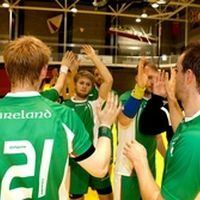 The Irish Olympic Handball Association (IOHA) announced the squad which will take part in the European Championship 2016 Qualification Round 1 in Tallinn, Estonia on the 31st of October. This is just the second time that Ireland will pit themselves against teams at this level in a EHF EURO qualification tournament, following Ireland’s historic participation in their first ever EHF EURO qualifiers in June this year. The squad includes the first crossover athlete from the IOHA Green Giant’s program, Brendán Ó’Riain, a basketball player from University College Dublin. Back court players Hichem Sefroun and Kari Andresson, and goalkeeper Robert Vaughan have returned to the squad for their first EHF EURO qualifying games, which has come as a boost after a number of long term injuries hitting the Irish squad. Captain Alan O’Brien describes the impact of the first EHF EURO qualifiers on the team. “We have had a long lead in to these games and are looking forward to putting all that training into action on the court. Ireland will also face Estonia and Belgium at home in the first week of April 2013, before wrapping up their campaign against Belgium away in June 2013.